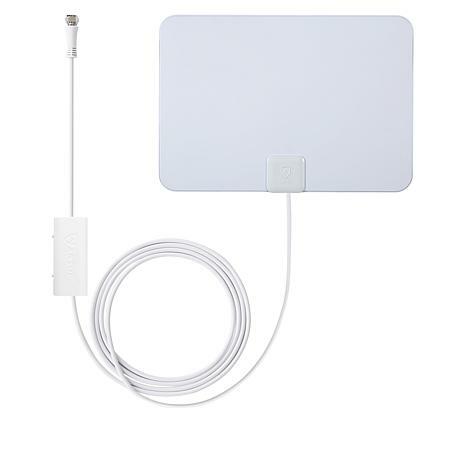 Watch local broadcast television with this paper-thin Smartpass-amplified HDTV antenna that receives free local over-the-air digital TV signals from networks such as ABC, CBS, NBC, PBS, Fox, and others. 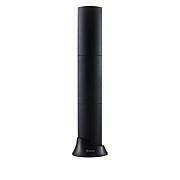 The compact size allows antenna positioning almost anywhere within your home while the paintable surface means it will fit easily into your home. 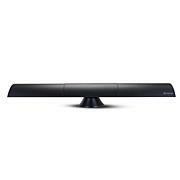 Do not place or hide the ANTOP Antenna in/behind any metallic objects. 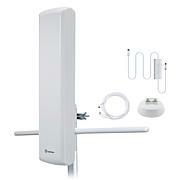 Install the ANTOP Antenna as high as possible and near a window for better reception. Keep the ANTOP Antenna away from any high power consumption devices to avoid interference. The ANTOP Antenna's effectiveness is influenced by the distance from signal origination point, station signal strength level, building construction, antenna positioning, reflections from nearby structures and any power consumption sources. The amount of free over-the-air channels you can receive will vary by area and antenna selection, check signal availability at FCC.gov. The number of TV channels and programs that you can receive with the ANTOP TV Antenna depends on the amount of over-the-air broadcasters in your area. We get 80 free channels including the major networks and a bunch of others. I used the amplifier, got a few more channels. We are getting a good signal with this antenna. I like that it is black on one side, white on the other. The box says we can paint on it so Im going to try my hand at decorating it. I recommend this antenna. Works well, received over 40 stations, show clear pictures, good product. Great purchase, move it around to see where works better.